Preheat oven to 375 degree F. In a large bowl, combine sugar and baking powder. Add galapong and mix with a wooden spoon to form a pasty mixture. In a separate bowl, beat eggs until foamy. Add eggs to galapong mixture; mix well. Stir in melted butter and coconut milk. Blend throughly. Cut banana leaf to fit the bottoms of luted molds. Wilt leaf by passing over an open flame for 1 to 2 minutes. Butter the sides of luted molds and line the bottoms with the banana leaves. Pour batter into pan. 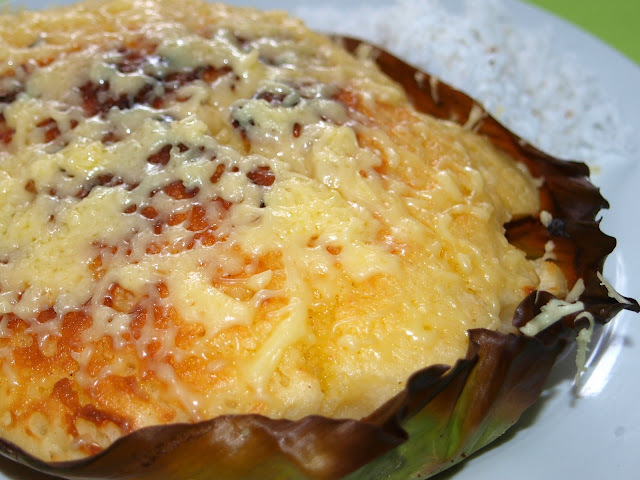 Sprinkle queso de bola, or grated cheddar cheese directly on top of batter. Bake until top is firm and golden brown, about 50 to 55 minutes. Brush with melted butter, cool in pan. Serve warm. Note: to make your own galapon, soak 1 cup malagkit (sticky)rice in 1 cup water overnight. Grind finely. It should have the texture of a flour dough. Let stand for one day before using for the bibingka. End.